Are you crafty and proud? 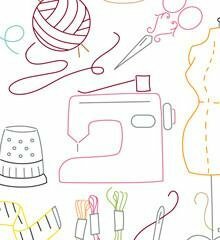 Is a sewing room heaven to you? Adorn your workspace, your knitting bag, your work apron - everything - with emblems of your many talents. Iron the design on any fabric you please and stitch away the afternoon. We have all the embroidery floss and needles you need to complete this fun project.